This handy, economically-priced Haggadah has been a best-seller for years. Now available with an elegant stamped and embossed leatherette cover! 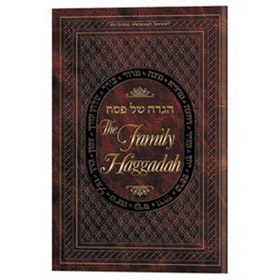 It contains the complete Seder instructions, a full text Haggadah with ArtScroll English translation and explanatory notes, The Family Haggadah keeps everyone on the same page! Accuracy is guaranteed by the Haggadah's two renowned editors, Rabbis Nosson Scherman and Avie Gold.